For the Mayans, the end of the world meant their ancient metropolis would be swallowed by jungle. Image Source: Ghost Hunting Theories. The history of the ancient world is being rewritten by a spectacular archaeological find in Guatemala, at the lost city of Mirador, the cradle of Mayan civilization (Hat tip: Ghost Hunting Theories). El Mirador, home to the world's largest pyramid by volume (La Danta Pyramid) and thousands of still-buried pyramids (including Le Tigre pyramid), is larger than modern downtown Los Angeles. The startling new find is a carved version of the Popol Vu, the creation story of the Mayan people. The frieze in question, dating back to 300 to 200 BCE, proves that Mayan mythology predates the cultural influence of Roman Catholicism by more than 1,000 years. 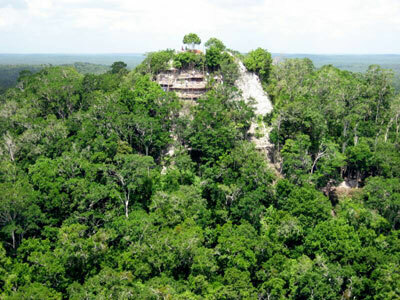 The city is hidden by a canopy of jungle, which swallowed it after the fall of Mayan society. For those fascinated by the Mayan 2012 predictions, Mirador reveals what the end of the world meant for its people. Descendants of the Maya still live on to this day, but their civilization is the stuff of archaeological digs. Imagine today's great metropolises - New York, London, Paris, Beijing, Buenos Aires, Delhi, Istanbul, Tokyo, Jakarta, Mexico City, Moscow - swallowed by forests. Then imagine what it would be like for the descendants of inhabitants of those centres to live on in relative obscurity. To contemplate surviving such a power shift is to understand the seeming implications of the 2012 Mayan prophecy.